John Snyder’s previous book, Hill of Beans: Coming of Age in the Last days of the Old South (Seapoint Books) was named a Best Book of 2012 by Kirkus Reviews. 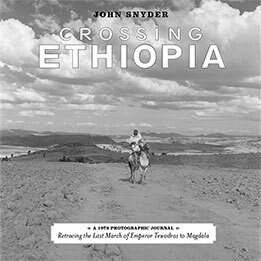 More than forty years ago, John Snyder, author, photographer and aspiring movie maker, with a Canadian history professor, his wife, and an Ethiopian translator set off across 535 kilometers (332 miles) of remote Ethiopia to retrace the route taken by Emperor Tewodros to confront the British Army in 1868. They traveled by foot, mule and battered Land Rover. The author recorded the expedition with stunning black & white photographs taken with his large-frame camera. The photographs depict a landscape and a people hardly changed from the time of Emperor Tewodros. Tewodros, emperor of Ethiopia 1855-1868, had the audacity to imprison 67 Europeans, including various missionaries and the British consul. His refusal to release the hostages provoked Victorian England to send in an army of 63,756, an overwhelming response by the great colonial power affronted by a remote African country. It was this dramatic event, and the climactic battle of Magdala, that John Snyder recounts in the text accompanying these remarkable images of a time that has now gone by. -James Atlas, author of Bellow, a Biography, and a memoir, My Life in the Middle Ages. -David M. Darst, CFA, Managing Director and Chief Investment Strategist, Morgan Stanley Wealth Management, and author of 10 books on investing, plus his latest work, Voyager 3, (Seapoint Books) containing his creative writing. -Charles Gaines, author of Stay Hungry, Pumping Iron, A Family Place, and The Next Valley Over. -Thomas L. Johnson, retired Librarian Emeritus of the South Carolina Library at the University of South Carolina, and co-editor of Camera Man's Journey, Julian Dimock's South, and of A True Likeness, The Black South of Richard Samuel Roberts: 1920-1936.